I was driving down the road when an old song came over my Sirius XM that I have not heard in a while. “Blue Monday” by Fats Domino is one of my favorites. That is probably because my dad is a fan of the piano player, which is a big deal because my dad is not a huge music person. As the song played, my mind wandered to other songs about Monday. Then, it wandered to songs about other days of the week. Before realizing it, I conceived of a blog post about my favorite song for each day of the week. This is not an original idea, but that keep me from this endeavor. Sunday – This song came to mind in a nanosecond. “Sunday Morning Coming Down” was written by Kris Kristofferson and best sung by Johnny Cash. When I hear it, I visualize wannabe country music star walking the streets of Nashville. Monday – Fats Domino’s Monday song inspired this post, but “Stormy Monday Blues” is my favorite song for this day. It has been recorded by a ton of people, but Bobby “Blue” Bland did it best. Tuesday – “Tuesday’s Gone” is not about the day. It is about a woman being left behind. Lynyrd Skynyrd had more famous tunes, but, for me, this one ranks at the top. It was also on their first album. Wednesday – Honestly, I cannot remember hearing a song about Wednesday. Upon searching, I found several but did not know any of them. I am not going to force it. I do not have a favorite Wednesday song. If you know of any let me know. Thursday – Well, this post is falling apart. I cannot think of a Thursday song, either. However, I went searching and found “Thursday” by Jim Croce. Since Jim Croce does not have any bad songs, this one is my new favorite. Friday – I am going deep for this one. Ward L. Chandler created the theme for Friday Foster, the movie starring Pam Grier. If you have never seen a Pam Grier movie, then I suggest you get on with it. She is awesome. Saturday – There are a ton of Saturday songs, and I like a bunch of them. However, I am going to take it into the deep tracks with “Saturday Night in Oak Grove, Louisiana” by Tony Joe White. He never duplicated his “Polk Salad Annie” success, but this one is good because it perfectly describes a big night in a small southern town. There you have it. A week of songs. What would your week look like? I hate Monday’s by the Boomtown Rats. Dark song but I still enjoy it. Saturday Night by the Bay City Rollers (I first saw them on the Howard Cosell show). Friday I’m in Love by The Cure. I forgot about the Howard Cosell Show. It was only for a short period of time. I don’t even know if it lasted a year. What can I say? I needed help with this one. I should have just listed Sting and left it at that. Nah. Wouldn’t be a list then, would it? Sunday – I have to agree with you 100% – Sunday Morning Coming Down. Sunday Bloody Sunday by U2 is a close second. But, I love every one of those “outlaws”. Wednesday – Waiting for Wednesday by Lisa Loeb. I saw her when I was in college. At the time, the only song I knew was “Stay”. She only had 1 album out. I loved every single song she did. So I went and bought the cd the next day, and love every song on it – including this one. Thursday – Once again, I have to agree with you – Thursday by Jim Croce. My dad was always into acoustical music, so I pretty much grew up with a lot of Jim Croce, Peter, Paul and Mary, and Simon and Garfunkel. Friday – Tough one! Friday I’m in Love is probably the best ’80s song not released in the ’80s. But, I’ll have to go with Finally Friday by the legendary George Jones. Saturday – As much as I love The Who’s cover of Saturday Night’s Alright for Fighting (not to mention Elton John’s original), my favorite would be High ‘n’ Dry (Saturday Night) by Def Leppard. Never forget Tuesday Afternoon — Moody Blues! He never heard it? How did that happen? He was working and drinking hard. There were not enough hours in the day. That’s a great list. 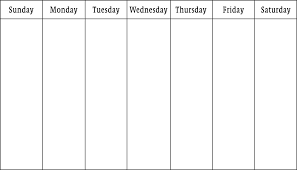 It is interesting how many songs are about the days of the week. My weeks are usually not song worthy.